WHOOOEEEE. we spotted a black tip reef shark at Socorro which is very very unusual. We do see 10 other kinds of sharks on regular basis. Today we arrived at Socorro Island and we spent our three dives between Punta Tosca and Roca O´Neil, the first dive at Punta Tosca was a nice early dive, in a quiet ocean and just as we start our descend all our senses woke up finding warm water 80 degree, nice visibility more than 90 ft, which was so good, because we enjoyed well the interaction with 2 cute giant mantas around. Which even came with us during the safety stop and backing on the skiff, all divers have spoken how beautiful and peaceful was this encounter!!! After we move to 3 miles outside to north where is the Roca O`Neil crazy dive site with spectacular topography of rocky bottom Plato which drops down to sandy area more than 140 feet where we cans find two huge arches starting from 120 feet to 50 feet full of lobsters and white tip reef sharks in a 90 feet visibility and we saw two giant mantas passing by on the top of the plato where was warmer than the bottom 77 degrees against 75 near to the bottom, all divers enjoy swimming through the arches and taking lot of pics on different angles!! Our third dive was Punta Tosca again, very relaxing and easy dive but bit lonely because this time was no manta at all but that don’t stop to our guest for search different stuff like we found nice nudibranch, young black tip reef shark (which is exceptionally unusual anywhere other than Clarion Island – Captain Mike) and many lobsters in a chilly water 75 degrees with 60 feet vis, so that it all for today but everyone on board of Nautilus Explorer are looking forward for our next day of diving at Cabo Pearce, no is time for hot tub, chatting and having some snacks and drinks under the sunset at Socorro island!! Newer Post Nautilus Explorer is the best!! + blog from chef Enrique	Older Post Not every day is perfect at Socorro Island unfortunately. Vis was down today. 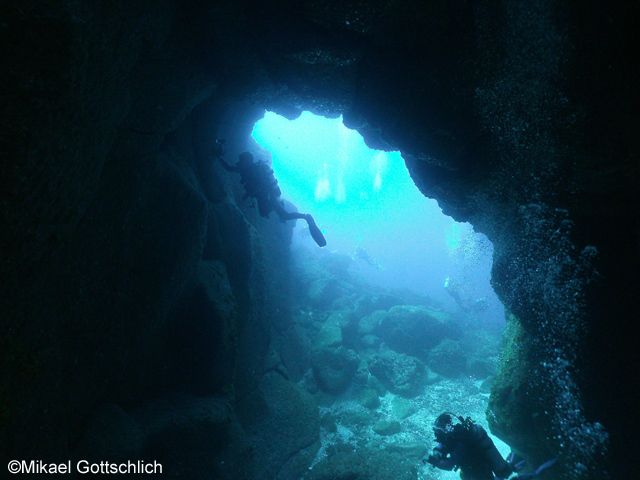 Not every day is perfect at Socorro Island unfortunately. Vis was down today.